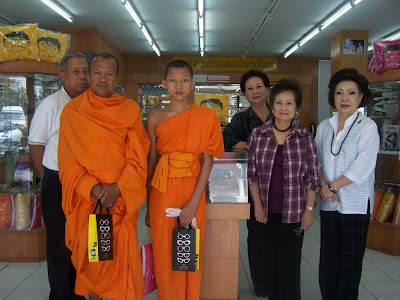 Khun Vannee Uboldejpracharak, Director and Secretary of TISCO Foundation, presented prescribed eyeglasses to two monks, Ukrij Dechatiwongse Na Ayuthaya And Anucha Eamsamang at Wat Wangtrakoo, Amphoe Muang, Nakornpathom, on March 21 ,2008. คุณวรรณี อุบลเดชประชารักษ์ กรรมการและเลขานุการ มูลนิธิทิสโก้ฯ เป็นผู้มอบแว่นสายตา ให้แก่พระอุกฤษ เดชาติวงศ์ ณ อยุธยา และสามเณรอนุชา เอี่ยมสำอางค์ ที่วัดวังตะกู อ.เมือง จ.นครปฐม เมื่อวันที่ 21 มีนาคม 2551. 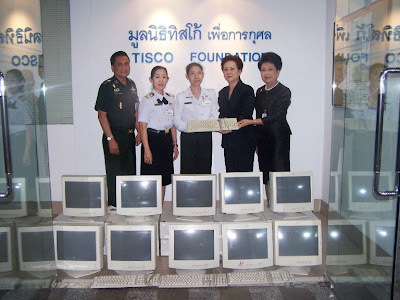 On behalf of TISCO Foundation, Khun Sasinee Phattiyakul, Head of Corporate Services, TISCO Bank, presented 10 used computers to the Weapon Production Center, Ministry of Defense, Lopburi, on March 19, 2008. The First TISCO Foundation Working Group Committee’s Meeting for the year 2008 was held on February 29, 2008.